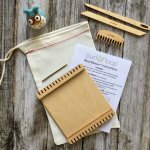 The Wee Weaver: This lightweight and portable birch loom is made of 1/8" birch wood, and measures approximately 4" x 4 1/2" with a work area of 3 3/4" x 3 1/2". There are 4 setts/gauges available; 4 ends per inch (4.0 e.p.i. ), 8.0, 10.0 and 12.0. The wee coaster size can be a max of 3 3/4" x 3 1/4". The materials for these looms are sourced in Houston, Texas and the looms are handmade in our Houston studio. 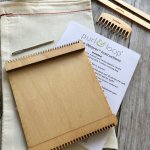 The loom comes with color photo instructions, wood tapestry needle, small metal tapestry needle for the smaller and tighter areas of the project, wee weaving comb, wee pick up stick and a reusable cotton carrying bag. 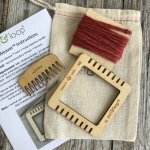 The instructions demonstrate how to make the wee coaster with fringe and without fringe. The Wee Weaver is an ideal way to learn the very basics of weaving in less than two hours. This is a great way to use up yarn stash.